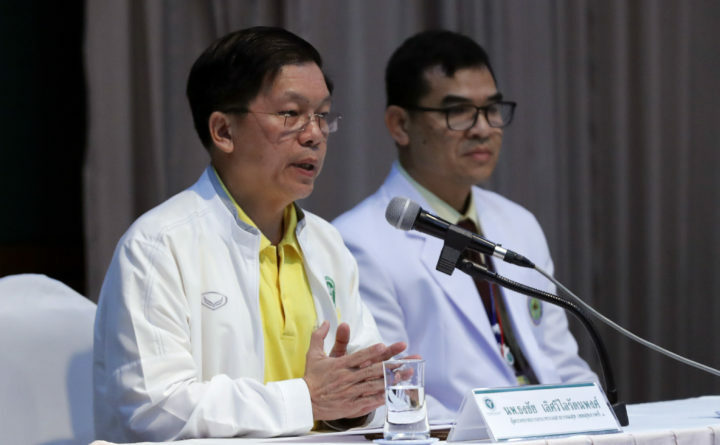 Thongchai Lertwilairatanapong, a public health inspector, left, speaks during a Wednesday press conference at a hospital in Chiang Rai province, northern Thailand. Thongchai said the soccer teammates rescued from a flooded cave lost weight during their two-week ordeal but had water while they were trapped and are in good health. MAE SAI, Thailand — As ecstatic relatives watched and waved from behind a glass barrier, the 12 boys and their soccer coach rescued from deep within a flooded cave in Thailand made the V-for-Victory sign Wednesday from their beds in a hospital isolation ward where they are recovering from the 18-day ordeal. The SEALs commander, Rear Adm. Apakorn Youkongkae, said the soccer coach, Ekkapol Chantawong, determined the order the boys from the Wild Boars soccer team should be rescued in. “The coach was the one to choose,” he said.